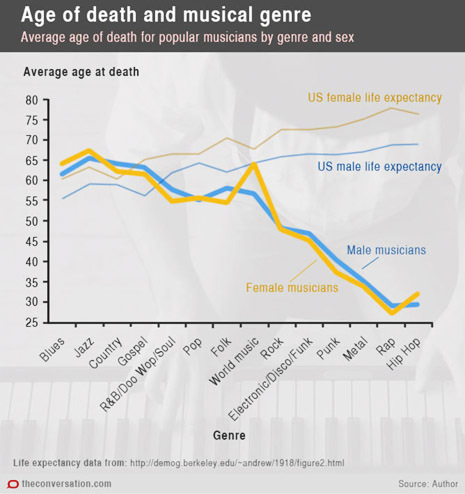 Notice how there’s very little difference in life expectancy between genders among musicians, as compared to the notably higher life expectancy for women in the non-musician population? Also, can you help but see that HUGE spike in women’s favor correlating with musicians in that nebulously-named “World Music” genre? I can’t even imagine why that might be. I also noted with interest that blues, jazz, and country musicians tended to outlive non-musicians. One could make all kinds of cracks about how the more socially-disreputable genres punk, metal, and rap/hip-hop have the lowest life expectancies, but recall that those genres haven’t really been around long enough to have all that many elders. Blues, jazz and country have existed long enough to see plenty of their practitioners die of natural causes before metal was even a thing, so that right there could tend to skew the chart in favor of longevity for musicians in the NPR genres. 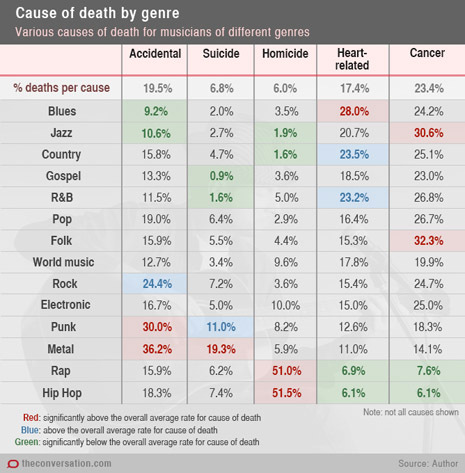 But then, once you get to the cause of death breakdown, you see that, utterly depressingly, homicide accounts for more than half of the deaths in the black genres rap and hip-hop, while the more typically white punks and metalheads’ tendency to die young is attributable to accidents and suicides. And unsurprisingly, musicians in the more venerable genres tend to be taken by diseases of aging. This is a morbid thought, but this post is about morbidity, so I’m rolling with it: as I’m chiefly a fan of rock music, I was a little disappointed that those ultimate rock death clichés, heroin overdose and small aircraft crash, weren’t given their own categories. In Kenny’s study, overdoses and vehicular incidents both fall under “accident,” and excessive drugs and drink could definitely explain the high number of punk and metal musicians in that category. But back in 1995, in the wake of the Kurt Cobain suicide, that great fount of underground smartassery Motorbooty magazine published “The Rock Death 200,” which similarly (and obviously somewhat cheekily) broke down 200 dead rockers and proto-rockers by age and cause of death. I can’t find it online, and I don’t feel like digging through my basement for it (if memory serves, it was issue #8, and had a blue cover, happy hunting). HOWEVER, the good Christian folk at Dial-the-Truth Ministries have published a list with very similar data, likely as a caution to young members of the flock who may find themselves tempted into sin, debauchery, gambling, ouija boards, organic foods, lots and lots of super-crazy hot nonreproductive fornication, and primetime soaps by The Devil’s Music. Their data collection (and web design) seems to come to a screeching halt in 1998, but interestingly, heart attacks edged out drug overdoses, and cancer took out more rock musicians than plane crashes. Also, drowning > AIDS > fire > choking.